Call it what you will. Foreshadowing, or planting information, is crucial to your plot line. I recently watched two movies that used plants in effective ways. One was True Grit, the new Coen brothers offering with Jeff Bridges, Matt Damon, and newcomer Hailee Steinfeld. I had seen the John Wayne version, in the theater when it first came out in 1969, (and cringed right along with everyone else over Glen Campbell’s performance. . .but I digress.) Shortly afterward I read the book, and was disappointed when I read the scene where young Mattie Ross fell into the pit and was bit on the hand by a snake. I was disappointed because the older version of the movie sugar-coated it. In the book, she lost her arm. In the movie, it was placed in a sling. Not so dramatic. watched the new movie, the little plant mentioned early on about snakes in winter jumped out at me like a disturbed viper. (I’m creeping myself out over these snake metaphors!) Mattie, Rooster Cogburn, and Texas Ranger La Boeuf are getting ready to camp for the night. It is mentioned that a rope surrounding the sleeping camper would keep snakes at bay. Then there’s the conversation about snakes not being active in winter. . .unless they’re disturbed. STRIKE! I knew what was coming, and I dreaded and felt thrilled all at the same time. Had I not known what was coming, I may not have been so aware of it. An average viewer who had never seen the original version or read the book, would probably have remembered that scene when they talked of hibernating snakes after Mattie’s unfortunate spill into the pit. But knowing about it made it even richer for me, more dreadful, as I anticipated that scene. I confess, I don’t remember if the camping scene and the talk about snakes is in the original as it has been a few years since I’ve seen it. After all, I was only three when it first came out! (Yeah. That’s hyperbole.) But if it wasn’t, how smart of the writers to include that tidbit for those of us in the know. Kind of their little nod to us, thanking us for giving Bridges/Damon/Steinfeld a chance to redeem that scene. Or, maybe the adapters of this film had an editor who called them on the fact that snakes don’t bite in winter. Therefore, they needed to inform their audience of how such a horrific thing could happen. The second movie that had a fun plant was Secretariat with Diane Lane playing the owner of the record-breaking triple crown winner. When Penney Tweedy is researching jockeys to ride the three-year-old hopeful, she learns about Ronnie, a take-no-prisoners kind of person who lives on the edge. Ronnie, it seems, rode a horse so hard once that its heart burst before reaching the finish line. And there’s your plant. If you didn’t know the history behind Secretariat, you would fear what might come next when, in the third race of the triple trophy, the horse uncharacteristically breaks free and widens the gap between the rival horse and, in fact, all the other horses in the race. He gallops as if that is his sole purpose in life. Above eating and sleeping. Above grazing on sweet meadow grass. Above bonding with his rider. He widens the gap by more than thirty lengths. And the audience holds their breath because they remember that Ronnie once rode a horse so hard its heart burst. Had it not been for that plant, the stakes would not have been so high and we would have experienced only the normal adrenaline rush when watching a horse race. And we would not have collectively let out the breath we were holding when Secretariat flew past that finish line, healthy as a. . .well. . .a horse. Plants can serve as a wink and a nod to those who know the storyline. Plants can inform so that when the event happens, it will be believable. Plants can up the tension and enhance the reader’s experience. This isn’t a Christian movie about a surfer who had her arm bit off. It’s a movie about a Christian surfer who rose above her circumstances and became a role-model to the world. I rank Soul Surfer a titch below Blind Side and Secretariat. I remember when Bethany Hamilton’s story hit my news channel. It struck me on an emotional level because I had named a character in my book, (Merely Players – now in the compilation Florida Weddings,) by the same name before I had even heard of the young surfer. In an odd, parallel universe way, it almost felt as though my created character had gone through the same thing. Much the same way as if this had happened to someone with the same name as my own child. So I became emotionally connected. This is why I had to see this movie on it’s premier weekend. And I wasn’t disappointed. The acting is believable. Thanks to A-listers Dennis Quaid and Helen Hunt, who portrayed struggling parents who love their baby and only want the best for her. AnnaSophia Robb is believable as the teen Bethany, and Carrie Underwood even delivers as she tries out her acting chops portraying a trusted youth group leader. The setting. Filmed entirely in Hawaii, the scenery is breathtaking. The wave scenes are heart-stopping as the camera dives under the water, through the water, over the water. It was so realistic, I expected to leave the theater wet! The attack itself. Convincing, but not overdone. Yes, there is blood, but it’s not gory. AnnaSophia Robb really does have two arms. I saw them when she was plugging the film on the talk circuit. But after the shark attack, it had been effectively erased. The Hamilton family. It is so refreshing to see a family so supportive of each other. I saw no dysfunction, a common malady among much of the “entertainment” pushed into our homes and theaters at an alarming rate. The message. Yes, it has Christian content…(ooo, run for your lives!) but the inspirational theme comes from the courage of a thirteen-year-old girl who overcomes. I give Soul Surfer 4.5 out of 5 stars. Again, I can’t pin-point why this movie isn’t quite in the same league as it’s inspirational predecessors mentioned in the beginning of this review. It certainly didn’t ruin my experience. There are some predictable moments, but they are presented in such a way that you’d be disappointed if they weren’t there. And hey, if that’s what happened, that’s what happened. Even though it was a true story, the writers expertly wrote a plot that kept me interested. Take tissues. Win a Starbucks Card in OREGON WEDDINGS Contest! Want to get in on the fun? I’d like to give away three Starbucks $5 gift cards each to someone who has seen my book in a store. Go to Blog With A Giggle to see rules. What do Clint Eastwood (great cowboy hero,) Lee Van Cleef (great cowboy villain,) and Don Knotts (a great… er... cowboy comedian,) have in common? 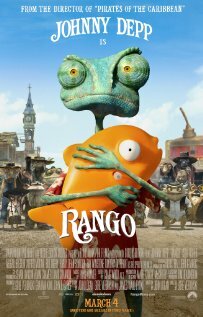 I just came back from seeing the animated feature, Rango, about a misplaced lizard who must learn who he really is… or die. (Cue the spaghetti Western music.) The animators and actors lending their voices had specific people in mind. Let’s start with Knotts. Johnny Depp had the Shakiest Gun in the West (1968) star in mind when he voiced the title character, a bug-eyed reptile, who, when we are first introduced to him is “acting” in his glass terrarium and directing the inanimate objects around him. Just when he realizes his script needs more conflict, he is thrust into the desert (I won’t tell you how so as not to spoil it, but I can tell you there is an armadillo involved.) He sets out on a very real quest to find water and eventually finds himself (literally and figuratively) in an old west town where adventure involves more than running from a hungry hawk. Bill Nighy, who played Davy Jones (not the Monkee, but the locker guy,) in Pirates of Caribbean: Dead Man’s Chest (2006), voices a villain so… so… venomous, I had a hard time watching the character on the big screen… in a good way. He had Lee Van Cleef in mind, the late actor who had ‘em shakin’ in their boots in such iconic films as The Magnificent Seven Ride (1972), The Good, the Bad, and the Ugly (1966), and For a Few Dollars More (1965). Timothy Olyphant, who is currently in theaters with I Am Number Four (2011), plays a character who will remind you of Clint Eastwood… like… really remind you of him. I bring these characters up because Eastwood and Van Cleef were known for the spaghetti westerns of the ‘60s and ‘70s. These were cheaply produced by Italian directors and actors, but featured Americans such as the aforementioned stars. It’s from these westerns that we have our pre-conceived notions of how the west was fought… and won. And it’s in this tradition that Rango presents a dusty town, a band of no ‘count, low down thieves, an ideal that springs from the Spirit of the West… and a lizard. I give this movie 4 out of 5 stars. It’s extremely intense at times and might scare young children, although the mini-man that sat in front of me with his mother didn’t seem phased, especially when he ran to the other end of the row of seats and proclaimed in his theater voice, “So long, suckers!” He was promptly contained and watched the rest of the movie on his mother’s lap. But I digress. I deducted a star for the intensity of the film and also for the language. Yes, it’s supposed to be based on the post-Vietnam westerns, and thus had some mild curse words, but if you’re sensitive, or if you don’t want your child quoting the few (a very few) lines, you might want to see it first before taking your family. Other than those two things, the storyline was enjoyable. It took a predictable plot but twisted the suspense in a way that often had me breathless. This website is for the express purpose of education in the craft of writing. It is assumed that the reader has seen the movies discussed in each article. Check out my fiction books HERE. Disclaimer: Images and excerpts on this site are the properties of their respective studios and I make no particular claims about them. I cite fair use in that this is a nonprofit blog for educational purposes only. Please notify in the event of violation and said items will be removed immediately.